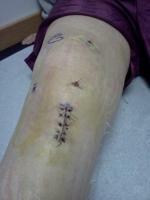 is it possible for my son to play football again after three ACL surgeries in the last 20 months. The first tear came during a block. The second tear came when he returned back to contact too soon. The third tear came because the graft failed and had died in his knee. He is a junior now and wants to come back for his senior year. He has worked extremely hard during his rehab each time and has the will power and the support of his team and coaches.